A small group of Russian technologists, led by inventor Andrew Kazantsev, is looking to raise $14,000 with an Indiegogo project that seeks to build a full scale air hydroelectric station (Air HES)—its purpose is to extract water from clouds to power a turbine on the ground and to provide clean drinking water to people below. The project looks to combine technologies that already exist—extracting water from clouds, for example has been done for hundreds if not thousands of years, though up till now, it's been in the form of wringing water from fog. High flying balloons too have been around for a long time, as have turbines. The idea itself isn't the first of its kind either, Nikolai Tesla actually proposed a similar scheme back in 1915. The Air HES prototype consists of an aerostat, which is essentially a weather balloon, a water collecting unit, and a ground based turbine. The water collecting unit is a mesh sheet that captures water droplets in a cloud (at about 7000 feet) and funnels it below to a tube that extends all the way to the ground. There gravity acting on the water is used to drive a turbine. The balloon can be sent higher or lower to move to where the clouds are but must remain tethered to the ground. The water collecting unit can also pull smaller amounts of moisture directly from the atmosphere when there are no clouds. The team reports that their prototype has demonstrated an ability to collect five liters of water in just one hour's time. To find out if the idea is truly viable, the team needs to build a much larger Air HES, and for that they need money. Such a system, the team claims, could provide both electricity and water to people in isolated areas, offering a way to help those in impoverished places. If the full scale prototype is as successful as they believe it will be, the team says it will begin looking for investors to help fine tune the system, and then to manufacture and sell the finished product. They note that ideas such as theirs need to be explored as many climatology and population models suggest water shortages could become a worldwide problem as early as 2040. If they make the airship from black fabric, and mount a 1 or 2 KW flexible thin-skin solar panel network on the top side, they can use the sun's heat and the electricity from the panels to heat the air inside, turning the airship into a kind of hot air balloon. I was actually thinking of this very same system few days ago, but to supply potable water to the surface, not to generate power as is proposed here. The problem with using a dew catcher to supply water to housing and gardens/ farms is that a lot of water is required. So a very large airship would be needed. But it can be done. The other challenge is to build an airship which doesn't require helium, which is scarce and expensive, and will migrate through any material it's put in- even steel. If a country deployed a vast array of these units would they not be technically stealing water from people downwind in much the same way that diverting water from a river prevents the people downriver from accessing the same water? Also much like creating an artificial mountain range and a resulting rain shadow to the leeward side. ...a vast array of these units would they not be technically stealing water from people downwind in much the same way that diverting water from a river prevents the people downriver from accessing the same water? Yes, it's much like the 'Cloud Seeding' dilemma: 'downstream lands' are parched because existing water-bearing air currents are 'tapped upstream' when clouds are 'seeded' with silver iodide/dry-ice and made to 'rain out'. Also imagine dangers ground-to-7,000ft-tethered blimp systems would have for aircraft flying up to those altitudes. The 'tethered blimp' system employed by Britain over London etc as a deterence to lower flying fighter-bombers! If widely adopted, skies-to-7,000 would effectively be 'mined' with 'anti-plane booby traps! Oh oh. The article mentions Tesla. 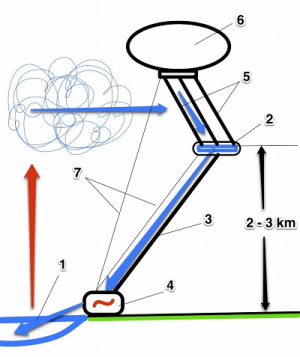 The similar system was proposed to generate energy from wind. they could make it 2in1 if not 3in1 if they could add transmission boosters for radio, phones, internet etc. As for the "stealing" of water it all depends on : wind currents. But i think they have in mind also the problem of global warming. I read some articles that towards 2050, we will have a lot of water vapors in the atmosphere as a dangerous greenhouse gas. So as water is evaporating from aquifers (which will be endangered) the only solution might be to get it back from the sky before it leaves the area. But i doubt that they could make a device of such an efficiency that it could provide also water for industry / agriculture. Probably it will barely provide enough drinking water for the population. Cost wisely although they don't offer any figures a 3in1 or 2in1 approach as i mentioned earlier would decrease the cost as the device will have various streams of revenue and might be energy self sufficient. There is a problem of scaling this up that relates to the limited lifting power of helium. As a rule of thumb, one cubic foot of helium under one atmosphere of pressure displaces its own weight of air plus one ounce (a piece of trivia I learned working in a helium research lab in the pre-metric days). 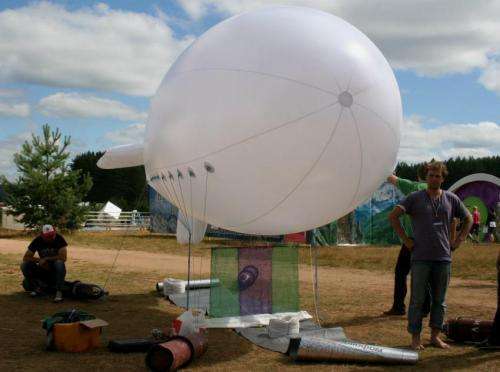 The aerostat must be capable of lifting itself, the water collecting unit, the connecting conduit for the water, and the tether in addition to the weight of the water collected. The conduit and the tether in particular become much more massive as they get longer. The tubing needed to reach 3 km altitude would weigh about half a tonne, and need about 16,000 cubic feet of helium to raise it into place. A 240-cubic-foot helium-filled tank goes for $175, last I heard. That's about $12,000 just to lift the tubing - EACH TIME. Then you add in the helium needed to lift the rest of the gear, and the water you collect.